I grew up in a small Texas town of less than 1000 people where high school football was king. On any given Friday night in fall, the majority of those people could be found sitting in the bleachers or standing along the sideline at the football game under the Friday night lights. The coaches and boys on the field were revered as demi-gods. Every fall it was a competition to see which was bigger, your hair or your homecoming mum. 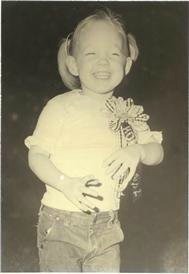 When I was very young, my dad was the football coach, so I was completely immersed in Texas football culture from birth (see exhibit A below). 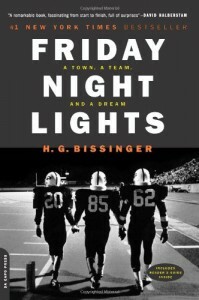 So with that in mind, the logical choice for today's theme is Friday Night Lights. Yes, people in Texas really are that serious about high school football.